I love getting food gifts. I don’t know if that sounds greedy or trite or just plain obvious, but I just love them. Food gifts give me a warm expectant thrill that can plant a smile on my face all day. Not just wonderful homemade goodies, but also food brought back from trips. Nothing too fancy, just a simple, well-chosen item that recalls a part of the trip at a totally different level from what a photograph captures — something three-dimensional that brings back a little smell and taste and texture. I already mentioned this gift before, as part of the Brussels Sprout Gratin that I made in a butternut squash half. The deliciously pungent round of camembert de Normandie brought back from France by K’s husband, L. Unlike most commercially produced camembert, Bernieres Jort camembert is made with raw milk hand-ladled into their molds (au lait cru muolé à la louche – the proud testament stamped onto their wooden cases). 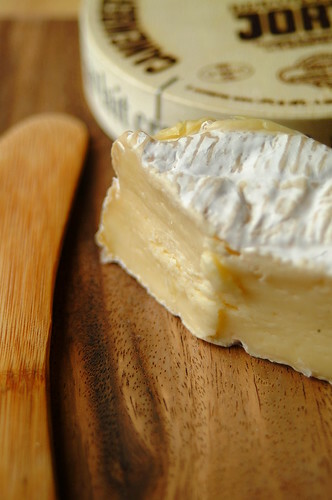 This is what gives each camembert made in this region its distinct taste and robust character that lingers sexily on your palate. When C and I first received the coveted package we rationed out little slices to each other, plain or with a little bread, not wanting to distract from the taste. Then I started experimenting, pairing it with my dad’s homemade mango jam for a luscious and melty jam and cheese panini, making myself little canapés with the camembert topped with a dollop of strawberry jam and sprinkled with pine nuts, and of course, the Brussels sprouts gratin. – Break the eggs into a bowl and whisk lightly. – Break off the tough lower portion of the asparagus stalks and discard (or do what I do – keep them in a ziplock bag in the freezer until you have enough to make some vegetable stock). Slice the asparagus into 1-inch pieces. – Melt a pat of butter in a skillet. Once the butter is melted, toss in the asparagus. Lightly sauté the asparagus until just cooked – just beginning to get tender but still with bite. – Pour your eggs in and quickly remove the pan from the heat. Stir the eggs gently off the heat until they start to come together and set. If you think you need more heat or they haven’t set enough to your liking, place pan back on the heat until they do. – When just about done, place the slices of camembert on the eggs and immediately transfer to a plate. – Enjoy with a slice of toast. Serves one. 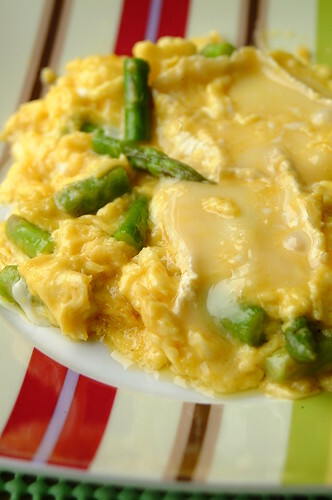 I like my scrambled eggs wet-ish – softly set curds nestled in creamy yellow eggy-ness. For this dish, I didn’t even need to put the pan back on the heat. The existing heat of the pan cooked the eggs exactly the way I like them. The rich creaminess of both the eggs and the cheese melting together made this simple breakfast luxurious and decadent. The asparagus’ bright green crunch reined it all in perfectly. If you really want to go over the top, try drizzling a bit of truffle oil on top.